Born Josep Andreu i Lassere in Catalunya in 1896, Charlie Rivel’s career began at the age of three and continued until two years before his death in 1983. He joined a circus as an acrobat when he was 15, and performed in a successful trapeze act with his brother Polo. In the late 1910s Lassere developed a trapeze act based on Charlie Chaplin’s Tramp character. The act was enormously popular, and reportedly was admired by Chaplin himself; along with this new-found fame, Lassere adopted the stage name Charlie (the provenance of Rivel is unknown). The late 1930s brought fame and fortune, but he was so unnerved by the events of World War II that he stopped performing; his 1952 comeback was hugely successful, and he performed as a living legend almost until his death. 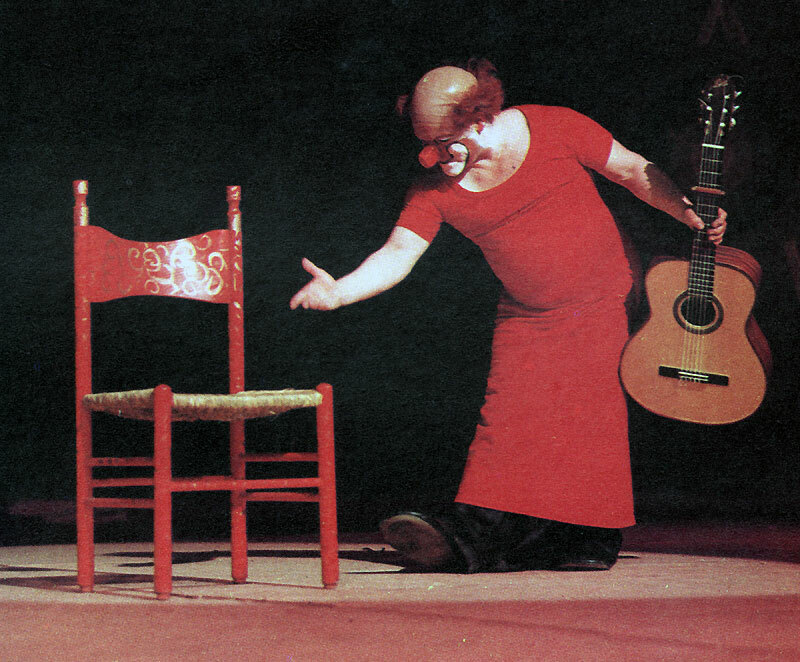 While he sometimes incorporated a concertina into his act, he is most often associated with the guitar; in his later years he typically entered dragging a chair and carrying his guitar, which he used for a parody of flamenco. This according to “Concertina clowns. III: Charlie Rivel” by Göran Rahm (Concertina world CDLX [December 2014] pp. 22–27). Above, Lassere as Rivel in 1967; below, his classic opening routine sometime in the 1970s.